A recent glorious wedding at Fires Creek! 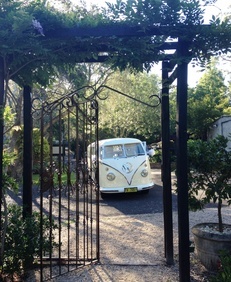 Our Klassy Kombi compliments the surrounds beautifully. The vineyard and private gardens are the ideal setting for your wedding ceremony. As the seasons change from winter to spring, summer and autumn the gardens at Fires Creek unfold their ever-changing colours.The winery opened its cellar doors in December 2003 to offer you a seasonal variety of boutique fruit flower and herb wines. Central Coast of NSW, in the beautiful Matcham/Holgate Valley.